At the September opening ceremony of Loyola University Chicago's Arrupe College, students greeted attendees. When leaders of the Society of Jesus visited Loyola University Chicago a year ago, the school’s board of trustees asked them for advice: How could private colleges better target and serve the growing number of poor students, who typically cannot afford Loyola and other schools like it. The leaders – including Rev. Adolfo Nicolás, superior general of the Society of Jesus – noted that the Jesuits already had figured out how to do this with high school students through a work-study program. Founded in 1996, Cristo Rey Jesuit High School has students work five days a month in entry-level jobs to help pay for their education. “They’re given a smorgasbord of courses … and they often don’t finish,” Garanzini says, and community colleges rarely provide needed counseling for students who start out behind. Garanzini then talked with high school counselors and principals and found similar results. Although high schools may offer all students a college preparatory program, those who rank in the bottom half of their class and go on to community colleges rarely achieve a degree. From this exploration emerged Arrupe College, a highly structured two-year program that aims to provide a sturdy on-ramp for high school graduates to eventually enroll in a four-year college or university. The college is named after the Rev. Pedro Arrupe, a Jesuit priest who dedicated his life to educating men and women to help others. At Arrupe, students attend two classes four days a week for eight weeks, and they attend them at the same time each day. A fifth day is reserved for advising and review meetings, or for students to work outside of school. The classes are small so professors can get to know the students. And the college provides extra services to meet whatever particular need a student may have. Without structure and personalized help, Garanzini says, students at larger, four-year institutions often get “lost.” The solution to that is not to cut back on their classes. “They don’t need less work; they need more work,” he says. One of these students is Evelyn Ruiz, a graduate of Chicago Academy High School on the Northwest Side. Ruiz says that when she started thinking about college, she worried that she wasn’t a good enough student. “If people are going to spend this money on me, I don’t want it to go to waste,” she remembers thinking. But a conversation with her father, who never finished elementary school and works at a printing company, changed her mind. “You’re always going to have to worry about paying bills and stuff,” she recalls him telling her. Mayor Rahm Emanuel attended the opening ceremony of Loyola University Chicago’s Arrupe College in late September. Ruiz is now one of the 158 students who make up Arrupe’s inaugural class, which began meeting this past summer. In two years, they hope to have an associate degree in arts and humanities, social and behavioral sciences, or business. The goal, says Rev. Steve Katsouros, dean and executive director of Arrupe, is that they then continue their education at a four-year school — Loyola or one of the 100-plus four-year institutions in the state that have already agreed to accept Arrupe’s 61 credits. Currently, few CPS graduates who start their post-secondary education at two-year institutions ever get a bachelor’s degree. 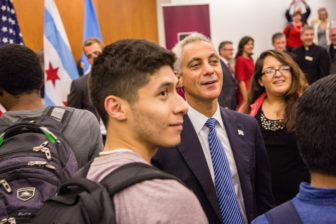 A report released last year by the University of Chicago Consortium on Chicago School Research found that just 3 percent of CPS graduates who did not immediately enroll in a four-year college went on to earn a bachelor’s degree within six years of high school graduation. All of Arrupe’s students attended Chicago schools, with about a quarter coming from private Catholic schools, another quarter from charter schools and the rest from district-run schools. Chicago Academy sent the largest contingent, 10. Andrew Johnson, who formerly coordinated Chicago Academy’s college programs, says he and fellow faculty were confident that because of Loyola’s high reputation and Arrupe’s small class sizes, the new college would produce higher persistence and graduation rates than City Colleges of Chicago, which is often the destination for students like Ruiz. Graduation rates across seven City Colleges campuses averaged only 17 percent for the 2015 fiscal year, though City Colleges officials note improvements in recent years. A key selling point for Arrupe was, indeed, its affordability. Tuition and fees total close to $13,000 for the 2015-2016 school year, but grants and scholarships brought the net to less than $2,000, on average. All incoming students are required to apply for federal and state financial aid. Katsouros says none of the current students is paying the full price. One demographic that stands to especially benefit from Arrupe is undocumented students, such as Lisset Larios, who don’t qualify for federal or state grants. After taking classes at Wright College while in high school, Larios says she wanted a more challenging option than a community college. A high school counselor suggested she apply to City Colleges and smaller schools, like Aurora University, thinking she would receive more financial assistance there. But Larios set her sights higher and applied to the likes of DePaul University and Denison University. The scholarship offers she received were not sufficient without also taking out loans. But as an undocumented student, she wouldn’t qualify for federally subsidized loans. With Arrupe’s financial assistance and additional outside scholarships, Larios’ tuition is less than $1,000. Similarly, Amundsen High School counselor Marinda Kennedy says three of the nine graduates from her school who are now at Arrupe are undocumented and received full scholarships. Kennedy adds that the small-group environment is also important. She thinks some colleges make the mistake of assuming students are prepared to handle the new academic challenges. During their first year at Arrupe, students work in a cohort that is separate from the rest of the university, and they are expected to meet with faculty advisers or counselors twice a month. “Right now, it’s appropriately challenging all of my students at the level that they need to be challenged,” says E.M. Miller, post-secondary coordinator for Chicago Academy. In the program’s second year, Arrupe students will mix with other Loyola students, depending on the classes they choose to take. Katsouros says he aims to enroll 180 students for the next school year and increase the number of black students, especially from high schools that encourage black males to pursue higher education. He attributes the discrepancy between black and Hispanic students to the short period of time Arrupe had for recruiting its first class. He also notes that the name of the school and the university’s grounding in Catholicism may make it more attractive to Latino students. Meanwhile, Larios and Ruiz already have their sights set on specific careers. Larios hopes to pursue psychology, while Ruiz hopes to become a probation officer. “It’s nice to know that people actually care about you staying in school,” Ruiz says.